Keri, a veteran leader of the Armenian liberation movement at the turn of the twentieth century, became also a prominent military figure in the last years of his life. He was born Arshak Kavafian in 1858 in Erzerum, where he graduated from the local Armenian school. He was twenty-four when he entered the short lived self-defense organization “Defender of the Homeland,” founded in 1882. He adopted the pseudonym Keri, meaning “uncle.” He went to Kaghezvan, in the province of Kars (under Russian rule), in 1889 and unsuccessfully tried twice, in 1889-1890, to cross the Russian-Turkish border into Western Armenia with groups of fedayees. He became a member of the Armenian Revolutionary Federation soon after its foundation in 1890, and was active in the region of Kars from 1891-1892. In 1893 he finally was able to go to Erzerum with a group of freedom fighters, and in 1895 he led an armed group that protected the locals and the prelate during the Hamidian massacres. In the early 1900s Keri was back in Kars under the command of the local A.R.F. committee. In 1903 he moved to the region of Sasun and participated in the Sasun uprising of 1904. After its defeat, he went to the region of Van and back to Eastern Armenian in 1905. During the Armeno-Tatar conflict of 1905-1906, Keri was one of the leaders of the self-defense I in the region of Zangezur (Siunik), where he mostly fought in the front of Angeghagot. Afterwards, with fifteen years of fighting experience in both Ottoman and Russian empires, he went to Persia, where he fought alongside Yeprem Khan, one of the leaders of the Persian Constitutional Revolution, from 1908-1912. Yeprem was killed in battle in May 1912 and Kavafian had his killers liquidated, taking the leadership of the Caucasian troops until the end of the conflict late that year. 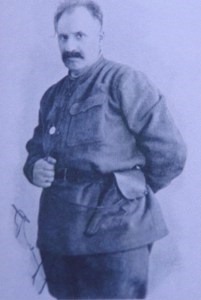 After the declaration of World War I, Keri joined the Armenian volunteer movement attached to the Russian army as the commander of the fourth battalion in 1914. He led his battalion in the battle of Sarikamish, between the Ottoman and Russian armies, in late 1914-early 1915. The courage of the Armenian soldiers and Keri’s military genius was crucial in the Russian victory. Keri’s career came to an end on May 15, 1916, when he was on his way to Mosul. Surrounded by Turkish troops and separated from a Russian detachment, Keri led the charge of his soldiers in the middle of the night and was able to break the Turkish encirclement, but he was killed in the battle. His body was transferred to Tiflis and buried in the Armenian cemetery of Khojivank, along two other freedom fighters, Nikol Duman (1867-1914) and Mourad of Sepastia (1874-1918). A procession of 30,000 people participated in the burial. However, the cemetery was mostly leveled during Soviet times, and Keri’s tomb also disappeared.